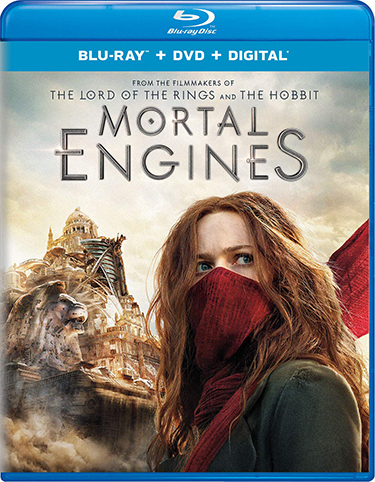 From visionary filmmaker Peter Jackson, Mortal Engines arrives on Digital via the digital movie app MOVIES ANYWHERE on February 19, 2019, as well as on 4K Ultra HD, Blu-ray, DVD and On Demand on March 12, 2019 from Universal Pictures Home Entertainment. Hundreds of years after our civilization was destroyed, a new world has emerged in Mortal Engines. A mysterious young woman named Hester Shaw (Hera Hilmar, Anna Karenina) leads a band of outcasts in the fight to stop London – now a giant predator city on wheels – from devouring everything in its path. 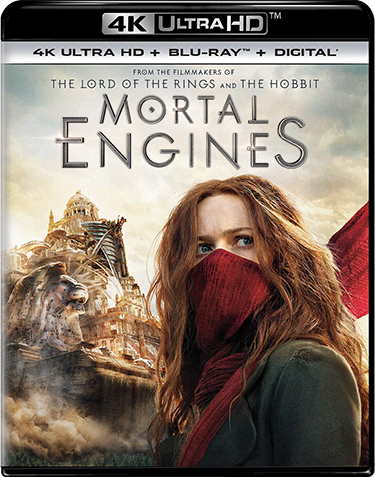 Mortal Engines on 4K Ultra HD and Blu-ray offers the ultimate in-home high-def viewing experience of the film’s one-of-a-kind special effects. There are more than sixty minutes of behind-the-scenes bonus features including an in-depth look at how filmmakers brought Mortal Engines‘ vision of the future to life as well as a director’s commentary with Christian Rivers. Based on the award-winning book series by Philip Reeve, Mortal Engines is the epic adventure directed by Oscar-winning visual-effects artist Christian Rivers (King Kong). Joining Rivers are The Hobbit and The Lord of the Rings trilogies three-time Academy Award-winning filmmakers Peter Jackson, Fran Walsh and Philippa Boyens, who penned the screenplay. Mortal Engines on 4K Ultra HD emphasizes the awe-inspiring visual effects, which were created by a Weta Digital team led by Ken McGaugh, Kevin Smith, Luke Millar and Dennis Yoo. On board as producers are Zane Weiner (The Hobbit trilogy), Amanda Walker (The Hobbit trilogy) and Deborah Forte (Goosebumps), as well as Walsh and Jackson. Ken Kamins (The Hobbit trilogy) joins Boyens as executive producer. Mortal Engines stars Hera Hilmar (Anna Karenina), Robert Sheehan (Geostorm, Three Summers), Jihae (“Mars”), Hugo Weaving (Lord of the Rings, V for Vendetta), and Stephen Lang (Avatar, Don’t Breathe). Welcome to London – In this 5-part, behind-the-scenes look, filmmakers reveal the secrets behind the ambitious undertaking of putting an entire city on wheels. End of the Ancients – Discover the secrets of the Sixty Minute War as you travel through the London Museum. Hosted by the Guild of Historians, hear what brought an end to the Ancients thousands of years before the events of Mortal Engines. Character Series – An in-depth look at the characters of Mortal Engines. In the Air – Join the Anti-Traction League as they reveal what went in to the creation of Airhaven. Film New Zealand – Go behind-the-scenes of the incredible, cinematic country of New Zealand.